Consider your front door the handshake of your home. Doors, interior and exterior, are often an afterthought when you get wrapped up in designing your home. Not to be forgotten, your front door is the first impression guests and neighbors see. It is the prime opportunity to express your personal style and set the precedent for what’s to be expected inside. An ordinary house can become the house with the red, purple, green, gold, glass door that intrigues any passerby and makes them want to peek inside. You wouldn’t want someone to think you have a weak handshake would you? Consider your front door the handshake of your home. With numerous variables to consider, it might sound overwhelming, but oftentimes the smallest adjustments can make a lasting impression. Elements to take into account range anywhere from door style and size, color, door knocker, glass accents, door material to everything surrounding—doorbell, greenery, doormat, pathway material, outdoor lighting and on and on. Start with your budget and let the extent of your design go from there. If the exterior of your home doesn’t exactly depict your style you can create a focal point with your front door to distract from the “not-so-you” façade. On the other hand, if you love the exterior finishes and landscape you should contemplate a front door that blends cohesively into the overall feel of the house. Also another factor for you to chew on—as if you need anymore—is the lighting in the interior entryway. If the front of your house is lacking windows, adding sidelights around the door or artistic glass in the door itself allows for more natural light to illuminate the interior. Interior doors need love too! Not all interior doors have to be white or wood with a box store handle or knob. With the outdoor elements excluded from consideration, let your imagination run wild with finishes. Furniture isn’t the only home item that can be upholstered! Upholstered doors with a nailhead finish in creative designs and divine fabrics make for a major impression. Go thrifting for vintage doorknobs or splurge on a sleek modern handle. Get creative! 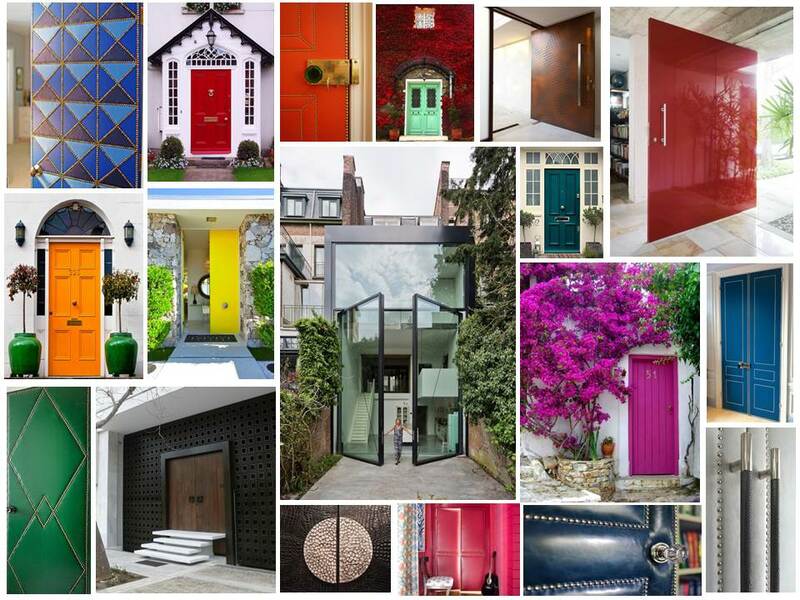 The visual library of stunning doors is endless, so check out Pinterest, Google, Houzz or that pretty collage I put together to rev your creative engine. 🙂 Turn your ordinary door into an oversized, whimsical, one-of-a-kind work of art! As always, if you don’t know where to get started the BW Team is on call and our design showroom is sure to inspire!